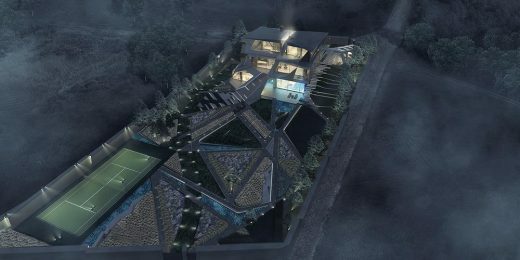 Construction of a unique futuristic private house in the Moscow suburbs started. 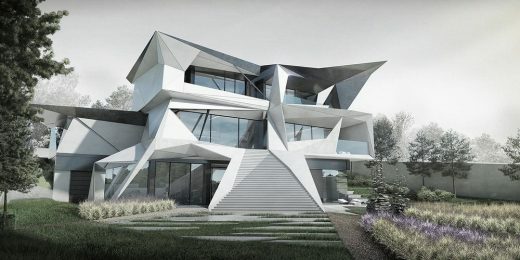 Parametric Residence is a building with polygonal architecture. Its design is based on the synergy of creative and artistic searches with algorithms of parametric computer modeling. This house is located in the Uspenskoe village (Rublyovo-Uspenskoe Highway) on the bank of the Moskva River, not far from Moscow. Project site is located on the border of the protected zone of the river. 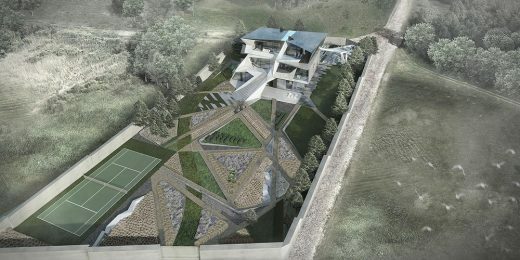 Therefore, there are wonderful views on the untouched nature of the river floodplain from the terraces of the house, and the building itself becomes a bright, attractive object, visible from great distances. 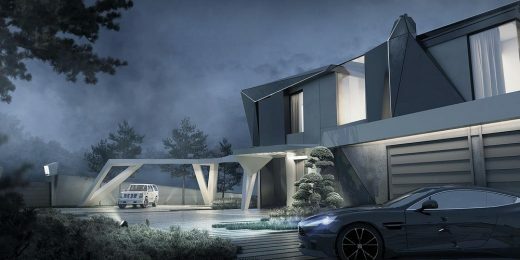 Parametric Residence is located on the terrain slope, which significantly influenced the design of the building, starting from the first sketches. 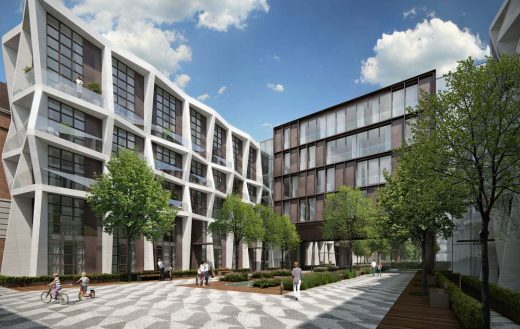 An unexpected futuristic interpretation of the image of 19th-century Russian manor-house with a wide front staircase leading to the garden is reflected on the facade facing the Moskva River. 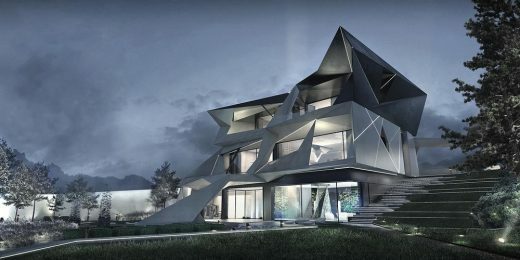 Multi-functional exterior structure is attached to the opposite facade. By its form, this art object refers to the geometry of the Möbius strip. Starting as a line above the entrance to the garage it descends to the ground, turning into a bench at the entrance, then flows into the canopy above the front door and later grows into a pergola over the guest parking lot. The design process was multistage and very varied. 25 different sketches of the future building was made at the earliest stage. Analysis of the optimal architecture of the house was made on the basis of these sketches. 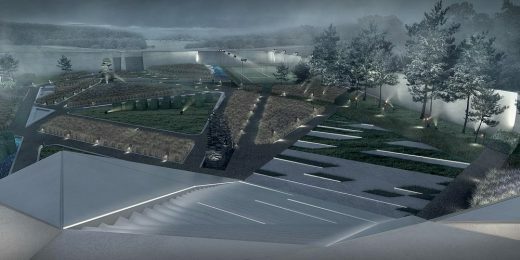 The final version was chosen from the sketches and became a starting point for the detailed design. A design group and engineering department worked on the project from September 2016 to December 2016. 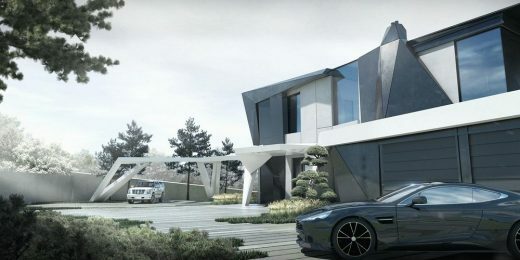 During this time the detailed design of the house was completed. 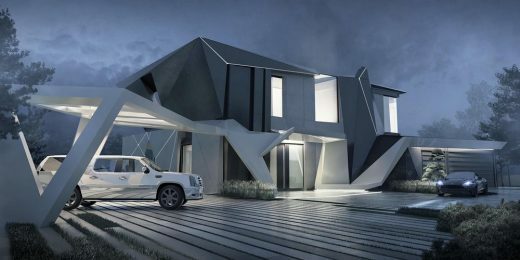 A fundamentally new façade system based on fiber-reinforced concrete was developed.